THE HAGUE – The Dutch Caribbean Coast Guard apprehended more illegal immigrants in 2016. In total 122 persons were arrested, of whom 36 near St. Maarten, St. Eustatius and Saba. The majority, 60, were caught in Curaçao and another 26 in Aruba. In 2015, a total of 88 persons were apprehended at sea. This was stated in the 2016 Annual Report of the Dutch Caribbean Coast Guard that Dutch caretaker Minister of Defence Jeanine Hennis-Plasschaert sent to the Second Chamber of the Dutch Parliament on Wednesday. The 2016 figures indicated a “slight, not worrisome” increase in the number of Venezuela migrants trying to reach Aruba and Curaçao illegally in search of an income due to the crisis situation in their own country. Besides the fact that human trafficking is against the law, these illegal transports often also include the smuggling of narcotics and weapons, it was stated in the annual report. In 2016, the Coast Guard again proved to be an important law enforcement partner in the Dutch Caribbean, stated Minister Hennis-Plasschaert in her accompanying letter. “The majority of the objectives of the 2016 Year Plan were realised. It was a successful year operations-wise,” she stated. The Coast Guard participated in 15 counter-narcotics operations in 2016 which resulted in the seizure of 3,572 kilos of illegal drugs – the majority being cocaine. The March 2016 confiscation of 1,100 kilos of cocaine was one of the largest catches in the history of the Coast Guard. The Coast Guard works closely with the Royal Dutch Navy and the United States (US) Coast Guard. The majority of the drugs are caught near Aruba and Curaçao, respectively 1,874 kilos and 1,506 kilos in six and seven actions. The St. Maarten Coast Guard station was only involved in two actions in which 192.3 kilos were seized. In 2015, the Coast Guard helped to seize more than double the amount in Caribbean waters, 8,782 kilos in total. Joint operations were carried out with the US Coast Guard near the Windward Islands. Joint operations were also executed with the French authorities, mostly in the area of search and rescue, in which the Dash-8 of the Dutch Caribbean Coast Guard carried out multiple successful search operations on the request of the Maritime Rescue and Coordination Centre in Fort-de-France, Martinique. Dutch and French authorities had earlier agreed to increase and improve the cooperation between the countries where it concerned operations in the Caribbean. This cooperation is based on an existing French-Dutch Customs agreement. The proposal to update this agreement is currently under consideration by the French Government in Paris, it was stated in the annual report. The plans for a joint coastal radar system have been put on hold as a result of reprioritising by the French Government. The Dutch Ministries of Foreign Affairs and Defence are working on a Memorandum of Understanding (MOU) with the Jamaica Government to establish a formal cooperation in the areas of search and rescue and of counter-narcotics operations. The MOU should be ready for signing mid-2017. A Letter of Intent was signed with the Government of Haiti in November last year in the area of search and rescue. 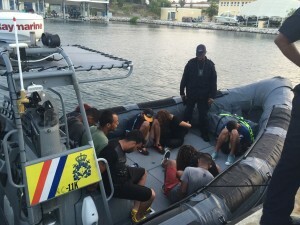 The Dutch Caribbean Coast Guard carried out 13 search and rescue actions near the Windward Islands in 2016 during which three persons were rescued. In Curaçao, 16 persons were rescued during 50 search and rescue missions, and in Aruba 15 persons during 67 search and rescue actions. Despite the operational successes, 2016 was marked by cost-cutting measures as a result of an adverse currency exchange rate of the Euro versus the US Dollar, stated Minister Hennis-Plasschaert. The 0.6 million euros that had to be cut last year especially affected the managing side of the Coast Guard. The Ministry of Home Affairs and Kingdom Relations BZK did compensate the total exploitation deficiency of 2.4 million euros. The total operating costs of the Dutch Caribbean Coast Guard over 2016 amounted to 19.7 million euros. According to the existing agreement, of these costs, 69 per cent was paid for by the Netherlands, 16 per cent by Curaçao, 11 per cent by Aruba and 4 per cent by St. Maarten.